First things first, I drew five names at random from the comments left on Friday’s post and Susan, Cynthia, Wendy, Alison and Kim all won some samples of Miss Mustard Seed milk paint. I sent emails to all five winners, I know I have multiple readers with those first names, so if you didn’t get an email, I’m sorry to say you didn’t win. But, keep in mind that you can still order 3 samples from Carver Junk Co for $18 with free shipping (use the code MILKPAINT), so I hope some of you will order some samples and give it a try even if you didn’t win. Now, on with today’s post! 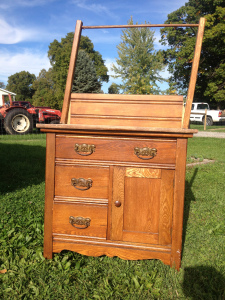 A while back (when the grass was still green and there were leaves on the trees) I picked up another small washstand. I’ve painted quite a few of these over the years. They make awesome bedside tables. Initially that was my plan for this one, so I didn’t even include the towel rack that came with it in my ‘before’ photo. That turned out to be unfortunate because a picture is worth a thousand words, and it will be so much easier to explain this with a photo so I borrowed a picture of a similar piece from the world wide web. Freakishly tiny photo, but it shows a towel bar at the back that is very similar to the one on my piece. Usually I just discard these towel bars. Much like mirrors on dressers, I feel like they hamper the versatility of the piece. You wouldn’t really want that towel bar on your nightstand for example. But then I had an idea for this piece. 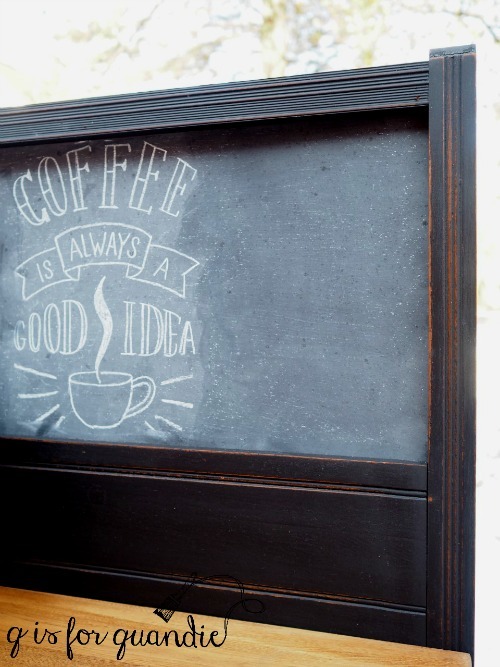 I decided to make it into a coffee bar, and to turn the towel bar into a frame for a chalkboard. I asked Ken to remove the round dowel that went across the top and replace it with a piece of bead board instead. Then he cut a piece of hardboard for the chalkboard and I painted it with Rustoleum’s black chalkboard paint. Initially I was just going to paint the entire piece, after all, here is what the top looked like when I brought it home. It was in pretty rough shape. But I love to pair a wood top with black paint, so I decided to try stripping it. After all, if it didn’t work out I could always paint it later. 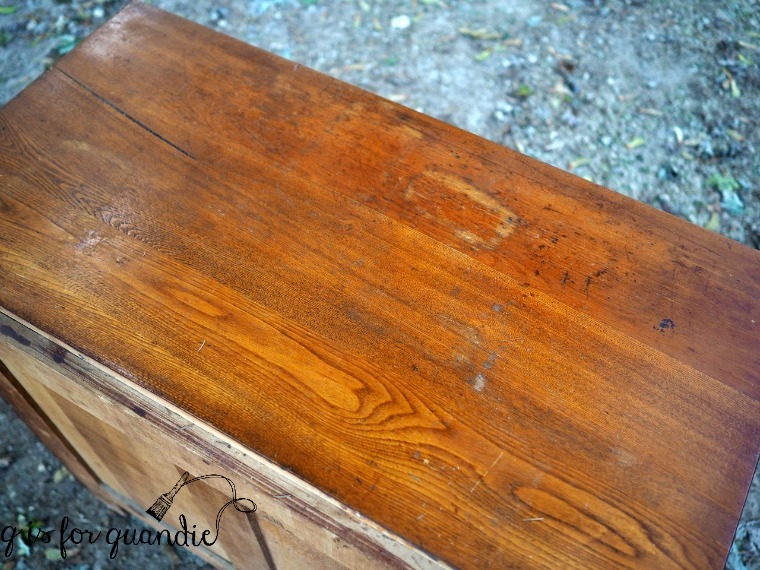 I stripped it, sanded it down and then waxed it with Miss Mustard Seed antiquing wax, and I’m so glad I did. It’s not perfect, but I still love the way it turned out. I painted the rest of the piece in two coats of Miss Mustard Seed’s Typewriter. If you haven’t tried milk paint yet, I always recommend starting with the black. It’s so, so easy to use. It often covers in just one coat, and I probably could have gotten away with one here but I like my paint really opaque so I went with two. I never have any trouble with the pigments dissolving with the black either. Also, as you can see, it distresses beautifully leaving a gorgeous authentic looking aged finish. And speaking of finish, I used Miss Mustard Seed hemp oil as my top coat over the black milk paint. 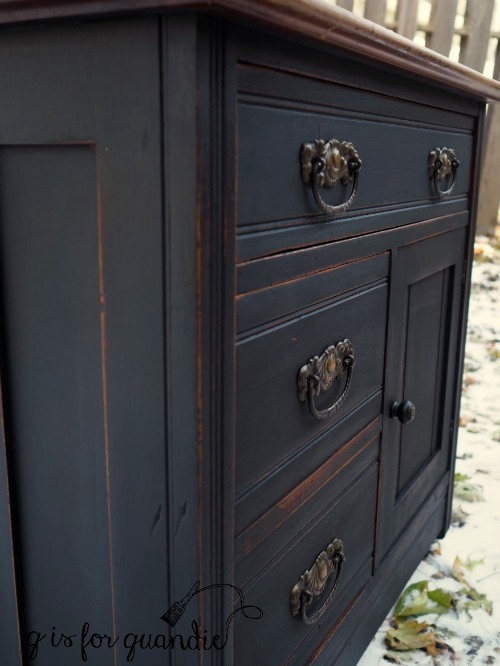 If you are new to milk paint, keep in mind that it’s the hemp oil that gives the black this rich, deep color. I cleaned up the original hardware by just scrubbing it with some dish washing soap and then I put it back on. To give it a little bit of an industrial vibe I added some chunky black wheels. Somehow I thought it would be more functional to have a coffee bar that is easy to move around. In hindsight, I’m not sure why I thought that. For use at parties? In case you want coffee in bed? Well, they look cool and they do add a bit of height to the piece even if there isn’t really a need for them. And in case you are wondering, yes, that is snow. Just enough to be pretty in the morning, but mostly melted by the afternoon. I drew the chalkboard using the method I shared in my tutorial last week. 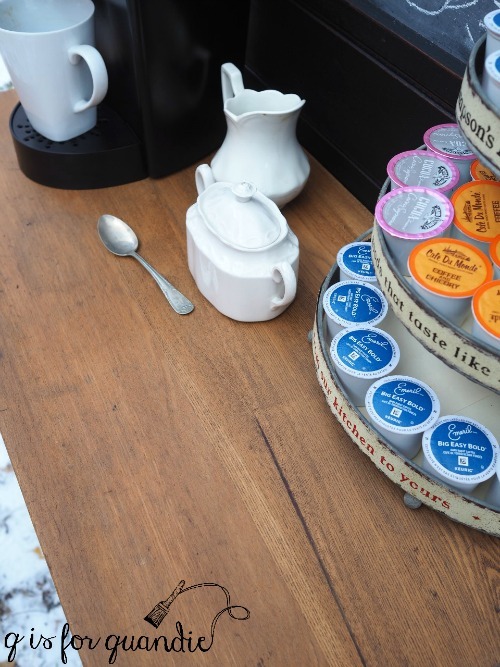 This coffee bar is the perfect size for your Keurig and all of your coffee making supplies. 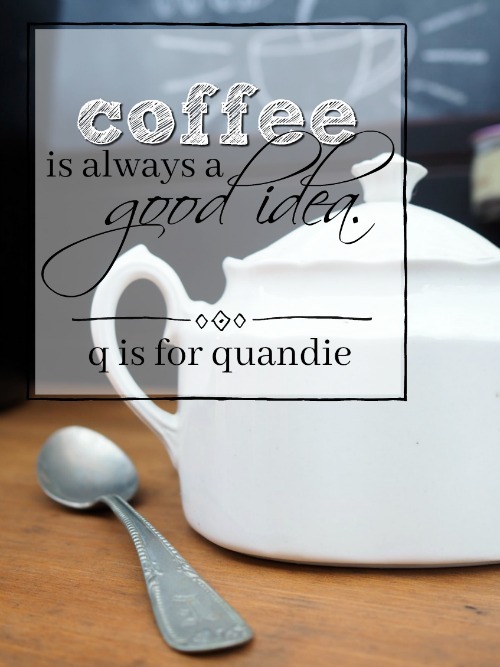 After all, coffee is always a good idea! Please check my ‘available for local sale’ page for details if you are local and in need of a coffee bar! Previous a sample sized giveaway. That is just lovely. Might be my fave but then again, I say that every week! You have such good vision! I have been on the fence about ordering some hemp oil, but this has convinced me. I really do like working with the hemp oil on dark pieces, black, navy (Artissimo, Midnight Blue), dark green. It’s much easier to apply than wax. I like to apply it with an inexpensive chip brush, and then wipe it down with a microfiber cloth (got that tip from Miss Mustard Seed). I love how soft the black is in milk paint. I have a dresser that I have been on the fence about painting black, but this post just pushed me over the edge to move forward with my plan. 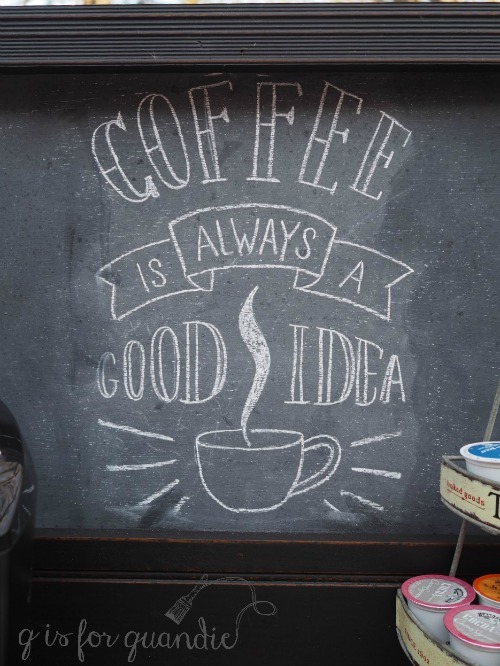 I love the way the chalkboard works with the coffee bar. I was thinking it would be great if you would update us sometime on the selling of your pieces – if you sold them yourself, or through Reclaiming Beautiful and what you thought sold the best. It would be so informative to us fellow furniture upcyclers. Thanks for the inspiration. Another great idea for a post Laura! I’ll have to put something together on that. As for the black, I will say that black pieces continue to sell really well for me. 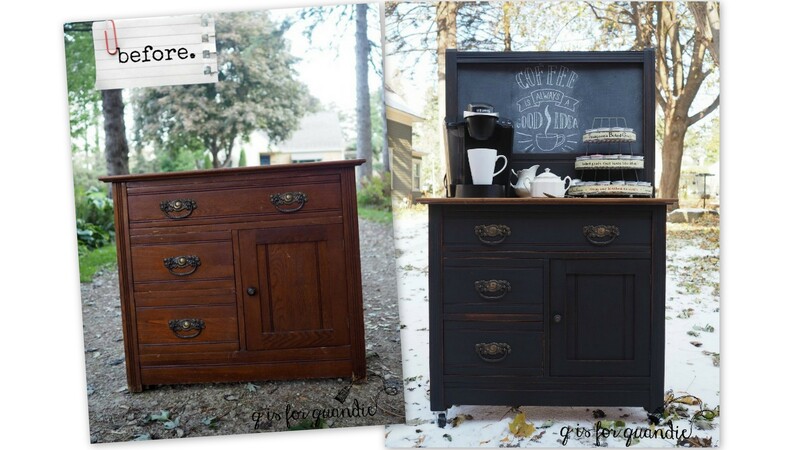 I love this idea fof turning a washstand into a coffee bar !!!! Once again. thanks for the inspiration!!!!!!! Another beautiful makeover. I think the black is so rich and gives the piece a little upscale vibe. Perfect size for a coffee bar and plenty of storage underneath for extra coffee, mugs, etc. The chalkboard makes it a one of a kind. Love it. There is some great storage in this piece! Yes, there is just something so appealing about the depth of Typewriter with hemp oil! Another great transformation! 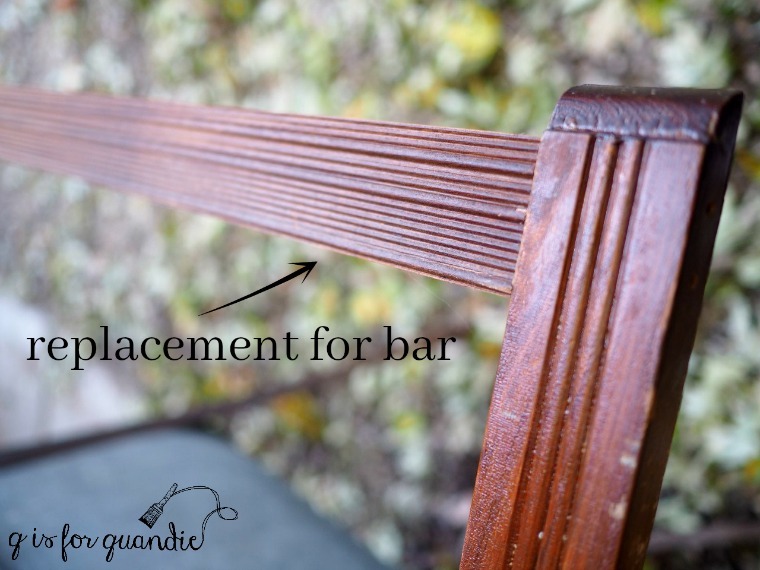 The not-so-perfect top gives the impression that this bar is already quite comfortable in its role…hey, could be a plain old “bar,”too. The wheels promise so many possibilities in the home. I think a little Disney break has refreshed your creative juice! I love the idea of using it as a plain old ‘bar’. You could tuck the liquor bottles behind that cupboard door on the right side, put a fab vintage martini set on the top. Awesome idea! This piece is soooo cool! I would have to use it for a Diet Pepsi stand though…havent managed to make it to the adult beverage stage yet. Love the wood top, the chalkboard and the deep, rich color. This has to be my favorite color…plus it’s so versatile. I can still see this used as a nightstand with the chalkboard…maybe using it as a reminder list, or even an affirmation list. Another great makeover! LOL, I think if you haven’t graduated to adult beverages by now it’s never going to happen Terri 😉 And I love your idea of using the chalkboard for affirmations bedside! I LOVE this piece! I so wish I lived close enough to you to purchase some of your lovely furniture. Did you just happen to get no chipping from the milk paint on this wash stand, or did you treat it to prevent chipping? I would love to try to get this look on a dresser. I could tell as I worked on this piece that the pre-existing finish was pretty dried out, which usually means little to no chipping. I did sand it and clean it with TSP substitute before painting, which will minimize chipping somewhat as well. With experience I’ve gotten a little better at predicting whether or not a piece will chip, but some pieces still surprise me. You never know what kind of products the previous owner might have applied. I often find that people add oily products to furniture in anticipation of selling it to make it look better and that can create havoc with paint of any kind. If you want to replicate this look, try sanding your piece well to give the paint a texture to adhere to and cleaning it with a grease cutting cleanser like TSP substitute just to be on the safe side. Thank you so much for taking the time to reply. I am saving your response and ordering some Typewriter and hemp oil! Well I do have to say it looks absolutely fantastic. What a brilliant idea to make it a coffee centre. You are not just another pretty face. So talented with that paint brush.It snowed here in Wasaga Beach,Ontario. Uggh I hate the winter. Love to Mom and Debbie (you too). Yes it’s Betty. Betty you are so sweet! You know, I used to be a winter hater myself but over the years I’ve learned to embrace it. I love being cozy and warm inside my snug little house while a snow storm rages outside. I like not feeling guilty about painting furniture instead of weeding the garden. And I love that my hair behaves so much more nicely in the winter than it does on hot, humid summer days! I love everything about this! 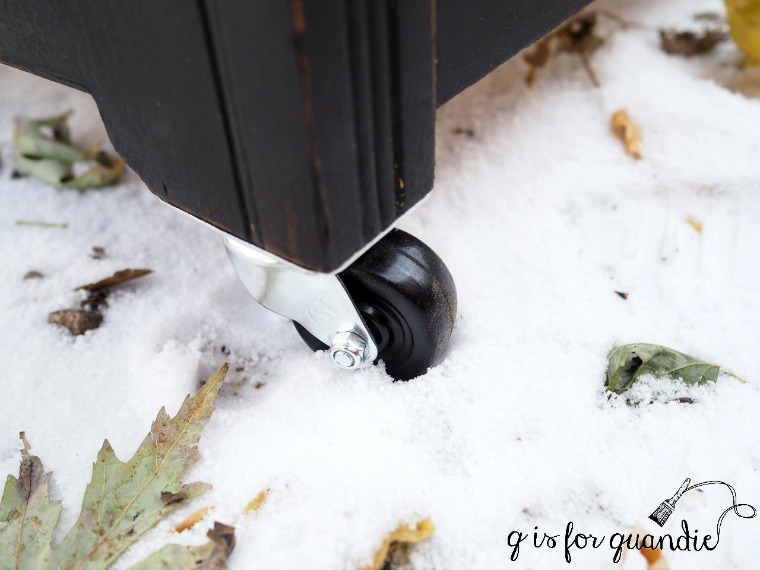 You made this such a wonderfully functional piece! And it is so pretty! I love this piece!! I have always loved washstands. What a great idea for a coffee stand. I do love the wheels too. How creative your are! Perfect size for a coffee bar! Beautiful. 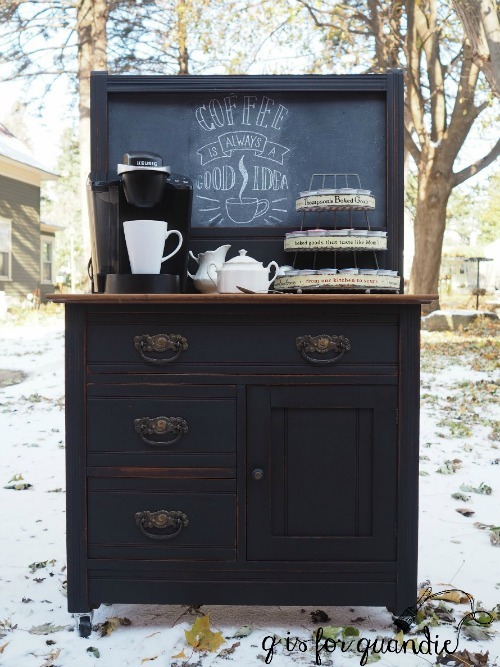 Great idea to turn it into a coffee bar and I love that it is black! Thanks Maureen. 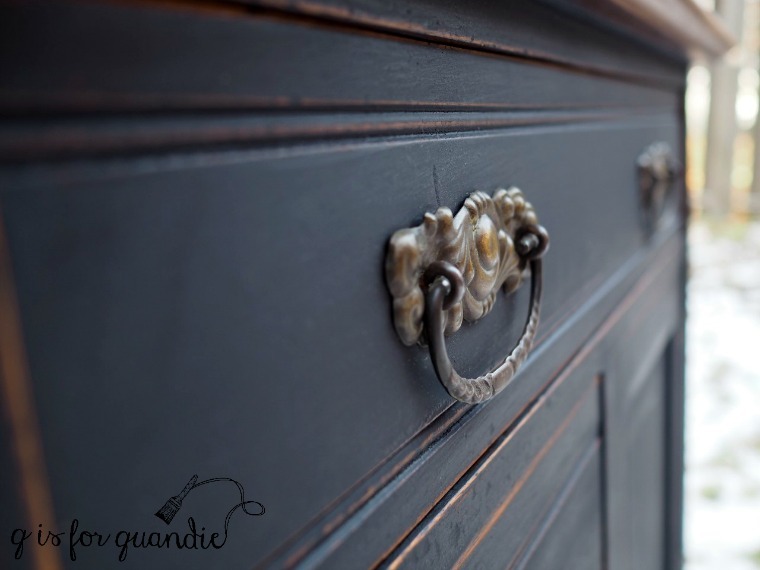 I find that black is still a really popular color for painted furniture! Wow! Love this. Beautiful wood top goes nicely with the black. And love the way you repurposed the towel rack! Thanks! I do love pairing black paint with a wood top. Love this so much! I would probably use it as a proper bar, but if you had little kids, how cute would a hot chocolate station be for the winter? Or the entry way in a restaurant or shop?? Seriously … endless uses! Home run on this one, Linda! I was also thinking this would be a great piece for a coffee shop, restaurant or even just a boutique of some kind! So cute! 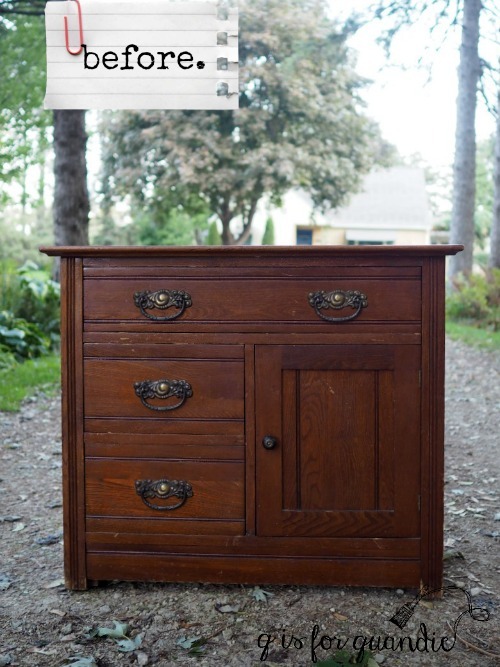 I would have never thought of doing this to a washstand! Love the black! I feel the same way about cold weather and my hair! Lol!! Another great Ken “fix it” too! I wish my husband had Ken’s skills! Well, don’t feel bad, my husband doesn’t have the skills that Ken does either. I’m very lucky to have a neighbor with great handyman skills and some time on his hands. a great makeover as usual! 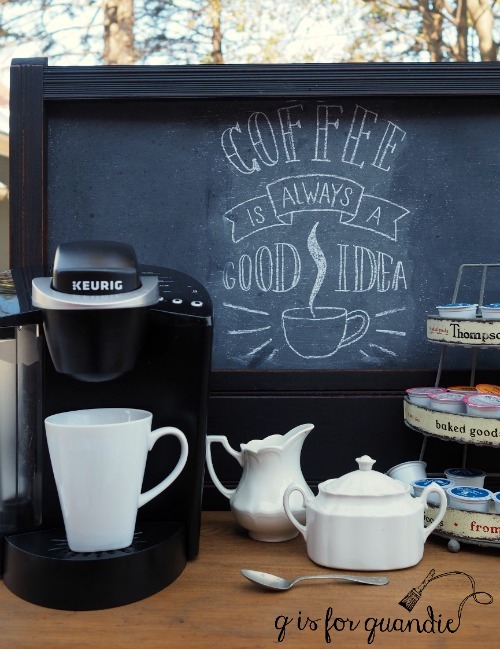 My eye was drawn to the rack that you have the K cups stored in – where did you find that?? That is awesome, isn’t it? I bought that at Reclaiming Beautiful a year or so ago. It’s a reproduction piece though, not truly vintage, so you may be able to find one online somewhere. They have them on Decor Steals and Antique Farmhouse frequently. Oh, good to know Shelly! Thanks for sharing that info. It does work great for holding k-cups! Very nice! Love the color and chalk board. Love the look of Typewriter on that coffee bar. Perfect combination. I know I’ve got some Typewriter stashed away somewhere so now I’m on a hunt for it. Hope I remember what I was going to do with it when I finally do find it! Thanks Sugar! Hope you find your Typewriter! It’s one of my favorite milk paints to work with. Another winner – you just keep on churning pieces out. You do amaze me girl!